*Please see below for more information. The Declare Mask has been formulated to help hydrate and moisturise the skin. This hydration will then help plump the skin, which reduces the appearance of fine lines. Your skin will be left feeling refreshed, moisturised and pampered. 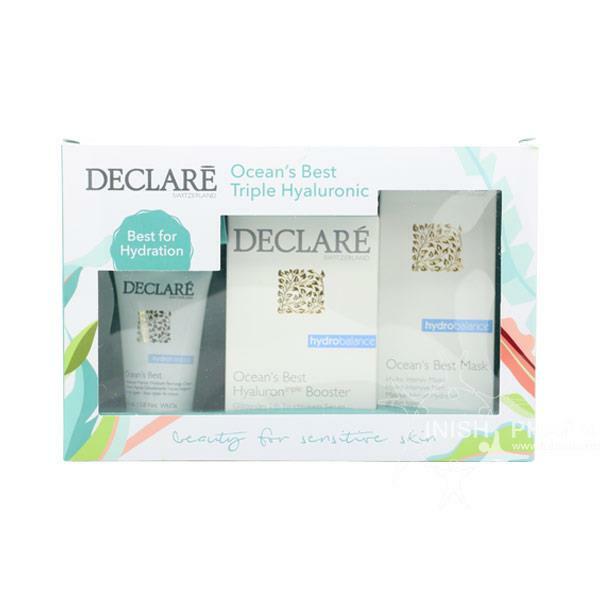 Declaré Ocean's Best Hyaluron Booster is a soothing, moisturising serum that lasts up to 24hours. This serum includes 3 hyaluronic acids which work instantly to offer your skin an intense moisture level, while also softening fine lines and wrinkles to leave your skin firmer and plumper looking. This formula also includes seaweed extracts that help fight external signs of stress including tiredness. The Declaré Ocean’s Best Recharge Cream is a soft cream that helps the moisture level within the skin. The active ingredients including sea minerals and seaweed all work together to bring the strength of the sea to your demanding skin leaving it feeling smooth and revitalised.